Do you use anti-aging? I do. After all, prevention is worth a pound of cure, right? I think pretty much everyone I know does in some way. It's usually just an eye cream, or a thick night cream, but we're still all looking to turn back the hands of time and look younger in our own way. You might not even know that you're using it. These magic 'actives' are in pretty much everything, and their marketing is sometimes scarily present in our everyday lives. But is there a deeper meaning behind anti-aging for many of us? Are we slathering products on to look younger for someone other than ourselves? In Korea and China, many women face pressures to get married and have it "together" by thirty, or other big age 'milestones'. In China, there is even a day called "Bare Branches Day". November 11th. It's pretty much a "Singles Day" and consumers are encouraged to spend online to drown out the voice in the back of their head that says "you need to get married and complete your life" constantly. SK-II are promoting the idea "I Never Expire" in their short film on Youtube. It's a huge step forward for a large beauty brand to start to developing a blockade against social stigmas and pressures in 2017, and this is an outstandingly positive message that is seeping through the cracks of our everyday marketing for products - and that is what makes it so interesting. are we worth less after turning 30?" The short film "I Never Expire" is about age-related pressure to marry, and essentially have someone next to you because you're expected to by family, friends, and social pressures. The "expiry date" is visibly clear and "worn" by the women featured in the video on their arm. It's seen by everyone, and the clock is always ticking for them, no matter where they are - travelling on the train, at the gym, or at a nightclub. SK-II are encouraging women to feel proud of their achievements and who they are, no matter how old they are. There is no expiry date on being successful and proud of yourself for your achievements. It's a very powerful feminist message that definitely resonates with me more as it is coming from a beauty brand, and we all know that they typically encourage us to moisturise away wrinkles, exfoliate away dead skin and rejuvenate ourselves to look younger every day. It's almost like a friend saying, "Sure, you can use anti-aging creams, but you don't need to use them for anyone but yourself." We have all felt the pressure of expectations at some point. We see on social media when our friends move upward in their careers and "life timeline" quicker than us, and we're hyper aware of photoshop, money and what society tells us to do.. which is exactly why I love this campaign. It promotes a fiercely passionate and feminist approach to change. It's promoting loving yourself and forgetting about anything but that, in the best possible way. "Can we decide for ourselves?" What do you think about the campaign? Do you believe that "expiry dates" for women are as strong as ever, or is society changing? This week I'm reviewing some brushes I have been sent by the brand Beau Belle Brushes. The brush set I was sent is priced at £59.95 on the website. You can also purchase it on Amazon. My initial impressions were "wow" as I'm a bit hot and cold about this price, given that the brushes are synthetic and the brand isn't well known yet; as most people probably would be. But I was honestly surprised by the quality of these. For the entire set, each brush works out at around £6. I think that it's an okay price. Would I pay £6 for some of them? No. I thought some of them were a bit useless and didn't leave me impressed, but others left me thinking "wow!" The ones I loved, were the powder, stippling, foundation, and tapered blending. I don't really like brush sets that mix and match eye and face, as it just seems incomplete. If I'm buying a brush set, I generally know whether or not I want the face or eye brushes included. I can sort of see someone's Mum buying this for them though. 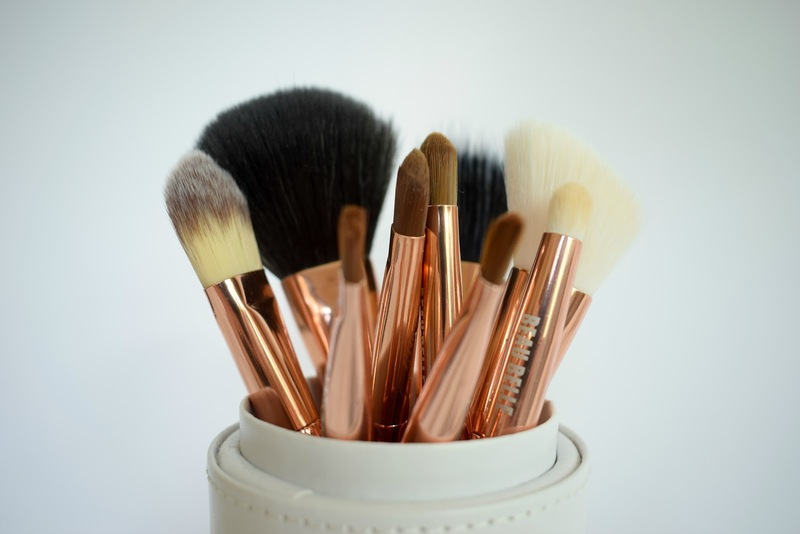 Powder Brush: This is a thick, fluffed out but not-too-soft brush that is perfect for bronzer or powder products that you really need to pack on. I think this is my favourite powder brush ever right now, it even beats my Real Techniques one. I love it when bigger brushes aren't too soft, as they tend to make the foundation slide around the face and bronzer can turn muddy, but I didn't have that issue with this one. When using it for the first time, one or two hairs came out, but since then I've had nothing. Phew! Angled Contour Brush: This might be too soft for a contour brush for some people. I perfer this is a great option for blush! It works wonderfully with the Colourpop Super Shock Blushes and diffuses the colour gently, as to not ruin your make-up. I like that it's white - because you can see just how much product is packed onto the bristles, meaning you don't end up going overboard and looking like something from a tacky Disney film. Foundation Brush: Nice brush. I mean, it's a flat foundation brush - is there much to rave about? It applied my foundation nicely and didn't shed. I enjoyed using this. Angled Brow Brush: This was just too thick, so much so that it just seemed pointless trying to use it on my eyebrows (which are thick anyway!) I think that it lacks precision, which you need in an eyebrow brush as to not end up with 'block' brows. I didn't like it, but I think this would make a really great tool to create eyeshadow looks with. It's just the right thickness to use with matte powders to cut the crease or line the underneath of your eyes with a pop of colour. So yes, it's a good brush.. just not for your eyebrows. Large Shader Brush: This is a great, sturdy brush for me. I loved using this to apply concealers and cream contour from the Anastasia palette. The sturdy, dense bristles allow me to pick up a lot of product from what is usually a very tough cream product, which is great. It's a brush that I have been missing from my collection but didn't realise I needed! Blending Brush: (The white brush from the set) This was a really soft brush, in a good way. I like some of the smaller brushes in my collection to be softer, and this is just the right size for the waterline or for blending out highlighter under the brows (if you're into that..) I do really like this brush and as it's white, you can see how much product is on it - perfect for if you're using it to line the waterline with colour or apply black! Shader Brush: Do we really need two shader brushes in a small set like this? Not really. This is possibly a bad choice from the brand - but Zoeva have done this too with their Rose Gold collection, just chosen lots of random brushes to shove in. I mean it's a good brush - I have the same things to say about this one as I do the Large Shader Brush... this is just smaller. Tapered Blending Brush: (The black brush from the set) This is not too dissimilar from the Zoeva 228 in that it's super wide and fluffy - perfect for a transition shade. It held up well, didn't shed and washed like a dream, and reshaped easily. Put the name and/ornumber of the brush, on the brush handle - like Zoeva, Mac and any other brush company do. I'm guessing the reason these aren't a blogging or youtube hit yet, is because it's so darn hard to tell people what brush you're using! The sets could be more cohesive. Eyes and face in one set, never really seem complete. The bristles differ too vastly on each brush. The powder brush vs contouring brushare so different. The powder is a "scratchier" kind of bristle, like Zoeva, wheras the angled contour brush is ultra soft, similarly to Spectrum. Overall, I think that these are really good brushes! They're better than Spectrum, which break like nobodies business, but we'll see how these pretty rose gold handles hold up over time. I do like the fact that they're synthetic, as having the choice between natural and synthetic bristles can be handy for different products. I would recommend these brushes and I do really like them.